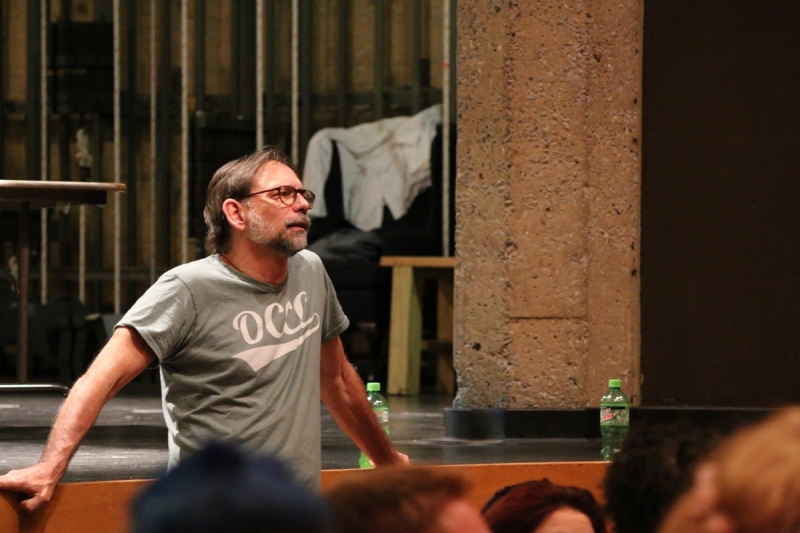 Theater Professor Brent Noel addresses auditioning students in the Bruce Owen Theater. “Cyrano” tells the story of a French renaissance man who feels he is flawed by his tremendously large nose. He discovers the woman he loves falls for Cyrano’s best friend, Christian. Cyrano then helps his friend write poems to her and teaches him what to say to win her heart. “The Cop in the Head” is an improvisational piece taking inspiration from Augusto Boal’s Theatre of the Oppressed. It takes audience member participation to convey what our society may define as oppression. 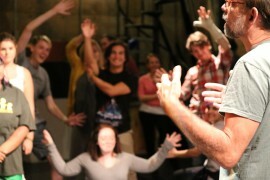 Over thirty people from OCCC, University of Science and Arts of Oklahoma, and interested community members combined seemed eager to get started as OCCC Professor of Theatre Brent Noel and USAO Associate Professor of Theatre Arts Katie Davis planned the exercises on stage for the students to go through. Katie Davis spoke with confidence as she called for all USAO students to stand up. She told the students to find someone they haven’t met before and introduce themselves. 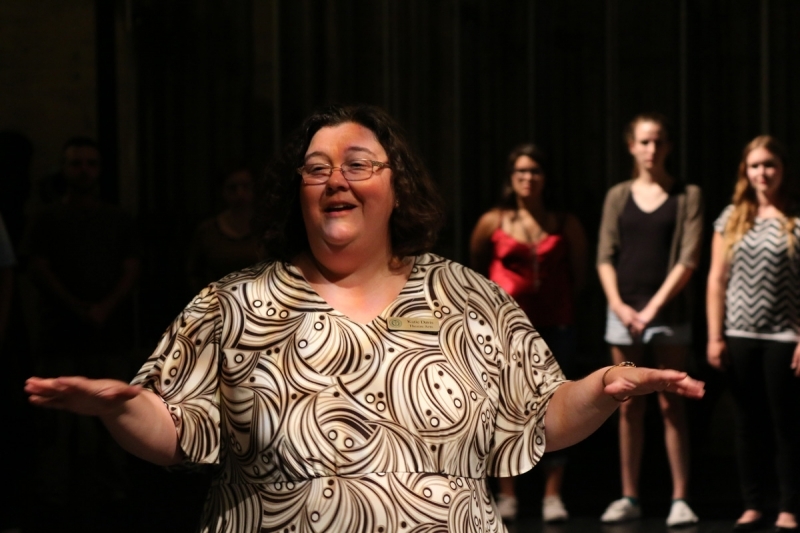 OCCC Theatre major Kala Anderson said she found out about the audition through Noel, who teaches one of her classes. USAO Musical Theatre student Ian Morrow said she chose to audition because it is part of her requirements for the major. “I would have enjoyed it no whether it was required or not,” she said. Morrow said she would be would be happy to be in either production. USAO Drama major Ali Love said she attended the audition to get a feel for the group of people she’ll be working with. She focuses as a makeup artist and tends to work backstage. “It’s very important for me to get to know the people I’ll be working with both on and off stage.” she said. Students shuffled and laughed as they walked around, shook hands, and even embraced fellow students to introduce themselves. Davis explained her role as director of “Cyrano” She talked about the plot and shared the ending to the crowd to get a reaction. 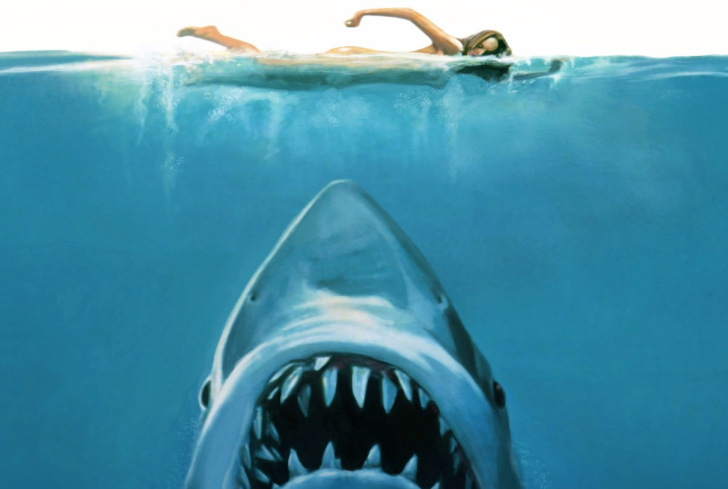 Gasps echoed throughout the theater when Davis described the tragic ending. 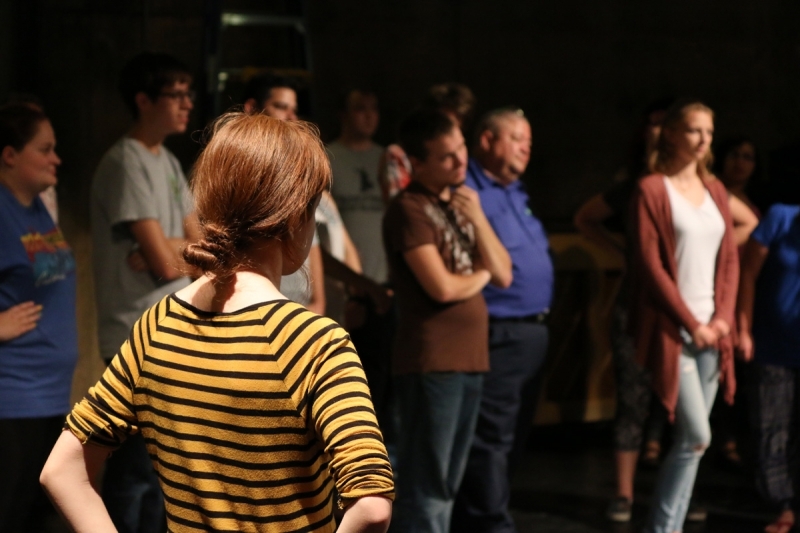 Davis said the production required an extensive commitment from students and participants, which includes a bi-weekly rehearsal schedule and travel to Chickasha. “Few exceptions can be made, but if you’re with us, you’re with us all the way. There are days you absolutely cannot miss,” she said. Noel took the spotlight as he talked about his role as director in “The Cop and the Head.” He said he wanted to create a dialogue with the actors and the audience with the scenarios he will put together in the production. “There is no storyline or plot to The Cop in the Head, we will create our own with input from the audience and see how oppression affects us all,” he said. After a short break, all participants were instructed to stand on stage and form a circle as the audition was about to begin. First was “Columbian Hypnosis.” Participants were instructed to find a partner and agree on a “leader” and a “follower.” Noel said the leader has to hold their hand six inches away from the followers face. The leader then had full control of the follower as the follower had to move in any way they could to keep the leader’s hand in front of them. Noel and Davis walked around to observe the creative ways participants would move their followers. They threw in variations where a leader had to control two followers at a time and see how far the participants could push their followers. The next exercise was called “This Is Not a Bottle.” Noel called for everyone to get in a circle again and slowly walked to the center of the circle with an empty bottle in hand. 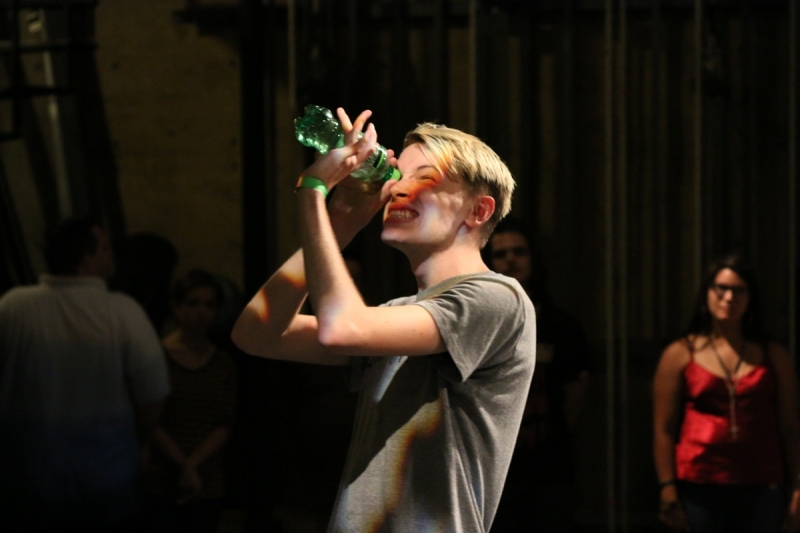 The rules of the game were for participants to use the bottle in creative ways to see what the bottle could represent. Once someone knew what the bottle was, then anyone could run in and take the bottle to bring life to it. “This is not a bottle!” Noel said. After a moment participants fought to get to the bottle since there was no turn structure. 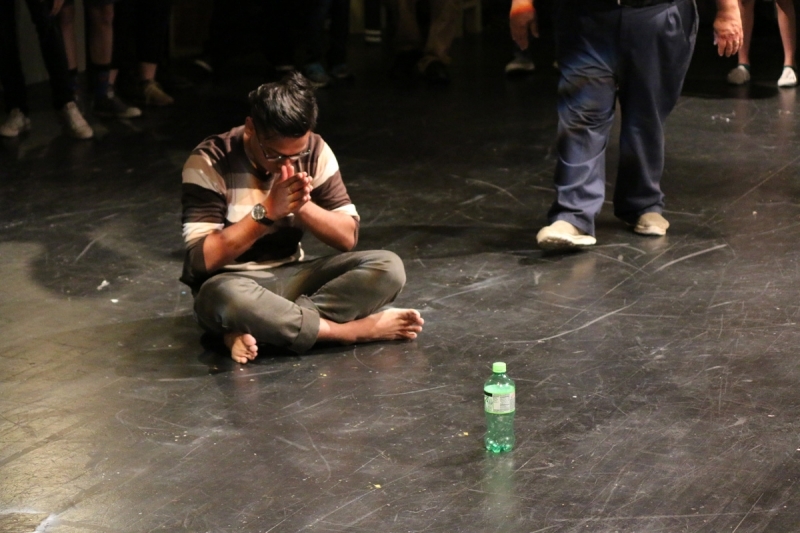 The bottle was swung, sang into, used to play an instrument, and even worshipped as students clapped and laughed when they realized what the bottle became person to person. Davis said “Stop!” as three participants stood in front of the bottle. “Now you three must agree on what the bottle is, without speaking.” The participants stared at each other for a few moments before one of them pointed the bottle at the ground. A metal detector was the silent agreement as one followed closely and the other used an imaginary shovel. One by one, participants poured their hearts out in front of friends and strangers while Noel and Davis silently listened in the background. Small inspirational quotes and happy thoughts mixed with statements of anger and sad frustration held the room as each person spoke. Participants paused for brief moments to collect their thoughts and respond when it was their turn. Some voices cracking as others were stern. “I felt a great deal of anxiety, being vulnerable in front of so many people is nerve wracking to say the least. But, transgressing your comfort zone is liberating and essential!” Anderson said. Finalizing the audition, participants were free to ask questions or speak any concerns regarding anything that came to mind. 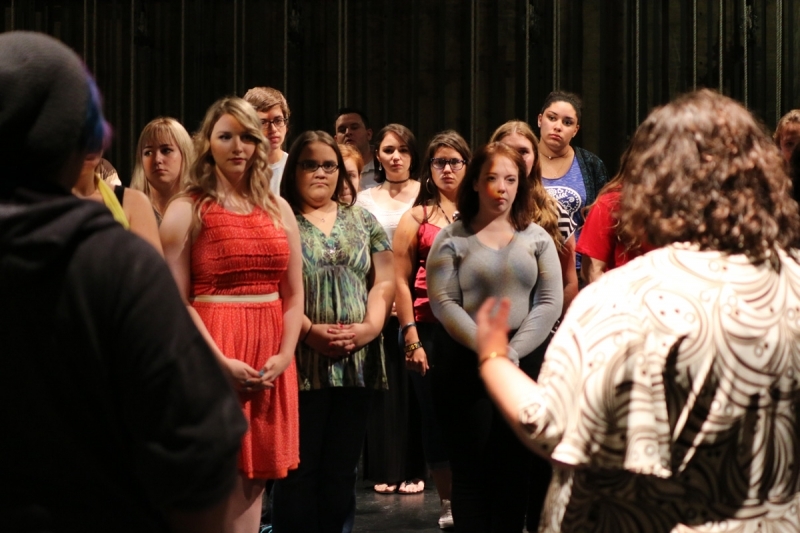 While the audition at the Bruce Owen Theater wrapped up, students prepared for the second round of auditions on August 25 where more of their skills will be put to the test. “The exercises we did were really eye opening and I was able to get a good take on all the people I’ll be working with. With all the different personalities I’m excited to get to know these people and I see the opportunities for me to expand.” Love said. 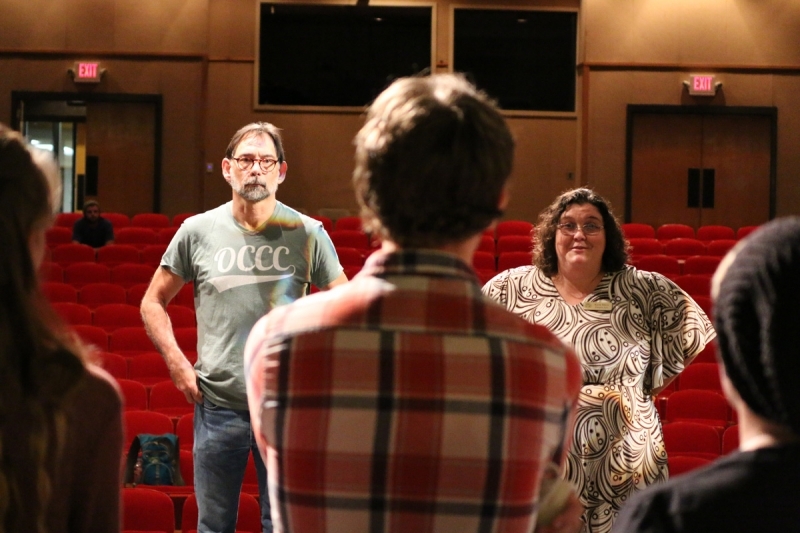 For USAO Musical Theatre student Ian Morrow, the process is all about theater magic. “I’m really excited for this journey in my life! 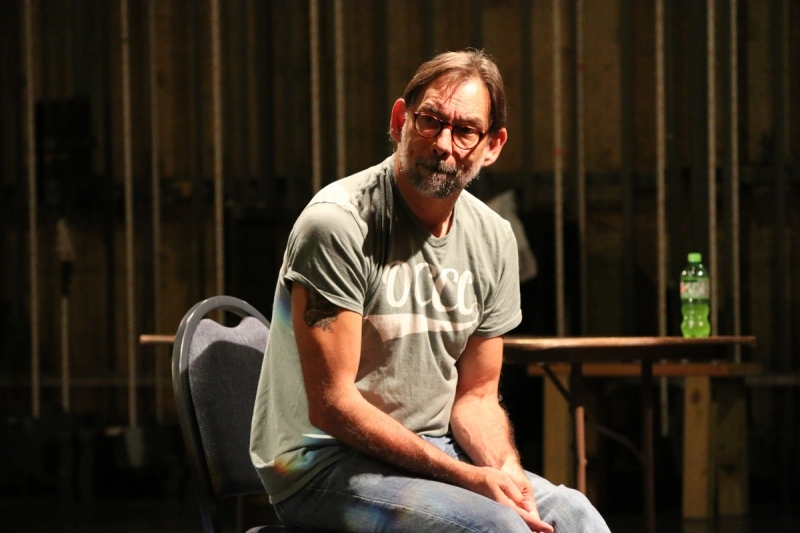 I’m so thankful I get to be here with this specific theatre family, I really do feel blessed beyond measure, and I can’t wait to work with all of them to create wonderful theatre magic,” Morrow said. “Cyrano de Bergerac” will premiere at USAO November 10-12, then the following weekend OCCC will host the production. 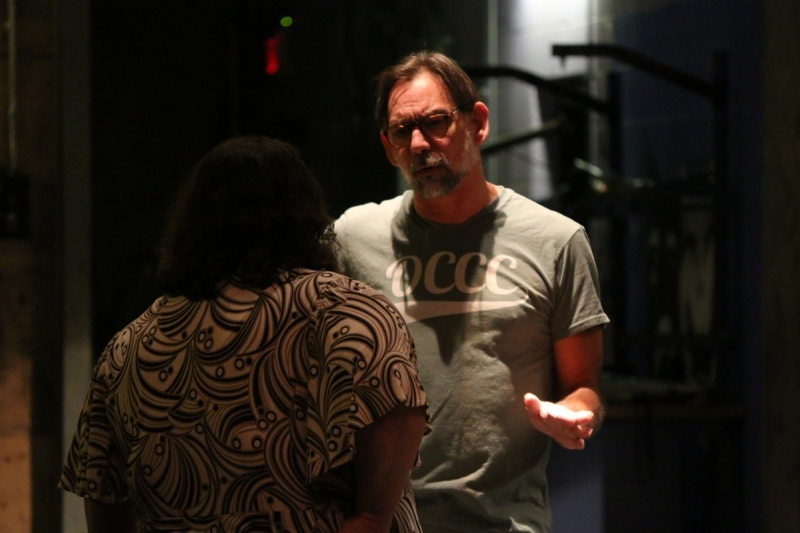 “The Cop in the Head” will premiere at OCCC October 6-8.